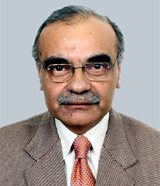 Amit Cowshish retired from the Indian Defence Accounts Service in 2012 after serving for thirty five years in various capacities in the Defence Accounts Department. He served on deputation with the Ministry of Defence first as Under Secretary and later as Additional Financial Advisor & Joint Secretary and Financial Advisor (Acquisition) & Additional Secretary. He also served as Commissioner for Departmental Inquiries on deputation with the Central Vigilance Commission. He has wide experience in the field of financial management in defence. While serving on deputation with the Ministry of Defence, he handled Defence Planning, budget and procurements. He was associated with drafting of the Defence Procurement Manual 2009 and its 2010 supplement. He was also associated with review of financial powers delegated to the services. He was member secretary of the Defence Expenditure Review Committee (2009). He attended the Advanced Professional Programme in Public Administration at the Indian Institute of Public Administration and the National Security and Strategic Course at the National Defence College, New Delhi. He did is M.A. and M. Phil in Political Science from Jawaharlal Nehru University and LL B from Delhi University. He holds a Post-graduate diploma in Alternative Dispute Resolution from the Indian Law Institute, New Delhi. He also holds pre-degree diplomas in Russian and Persian Languages from Jawaharlal Nehru University and a diploma in Urdu Language from National Council for Promotion of Urdu Language. Shortage of funds even to service the committed liabilities raises questions about the financial affordability of the defence modernisation programme and viability of the push for ‘Make-in-India’ in defence. It is important to pay greater attention to the system of costing followed by the MoD given that costing errors could result in the sanctioning of an unaffordable procurement programme, contract being awarded at a higher price, cost and time overruns, and default on contractual commitments. The Cell will remain hamstrung if its powers are not clearly defined, especially in regard to securing budgetary support which is to be provided by the Director General of Quality Assurance. Objectives and resources have to be in sync with each other and if adequate resources cannot be provided objectives have to be suitably recalibrated and alternative ways found to achieve them.